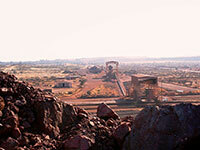 The mine previously supplied all of Assmang’s iron ore output since 1964. A series of large-scale infrastructure projects had maximized efficiency and productivity on site, which included a full washing and screening plant installed in 1975, and a jig plant to beneficiate off-grade ore, which was completed in 2001. 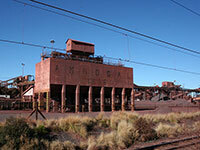 Assmang commissioned a new open cast mine, Beeshoek South, in 1999. The combined resources of Beeshoek North and Beeshoek South, five open-cast pits with supporting infrastructure, were needed to produce the annual iron ore output. By the early 2000’s, this output regularly exceeded six million tons a year. As a result, reserves at Beeshoek became severely depleted. The mine is in the process of expanding the East Pit and have started mining the Village Pit, which will significantly expand the life of mine (LOM) of the operation. Beeshoek mine is now mainly responsible for supplying iron ore to the local South African market, producing at 3 Million tons per annum. The ore is then moved via conveyor to a scalping screen, where oversized rock is separated and transferred into a secondary crusher. All crushed material is recombined and conveyed to the washing and screening section. Contaminated ore is directed to the jig facility for beneficiation. The washing and screening plant is capable of handling 1,400 tons per hour at full capacity and is controlled within the processing equipment efficiency limitations to maintain the required chemical and physical criteria. 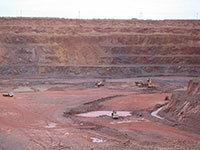 After washing and screening, the final products – Lump, Fines and DR Lump – are stockpiled on final product stockpiles located at the mine’s railway siding. 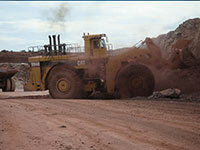 The jig plant is capable of processing 650 tons lower grade contact ore per hour. After secondary crushing, the off-grade ore is placed on the feed stockpile at the jig plant. Ore is then pulled from the stockpile for tertiary crushing. Subsequently, the material is stacked on to Lumpy and Fines jig stockpiles. The ore from these separate stockpiles is then fed into the jig plant, where pulsating water flows into the bed to separate the less dense fraction waste from the denser fraction middling and high quality ore. The waste is dewatered on screens and conveyed to a waste stockpile. The middling and high quality ore is passed over its own dewatering screens before being conveyed to separate conical stockpiles. Feeders beneath these stockpiles combine the products into the desired ratio to produce a beneficiated product ready for blending into the final product. The final products is then stockpiled onto the same final product stockpiles as the washing plant product.